When discoloration, chips, or misshapen teeth riddle your mouth, you may feel like a beautiful smile isn’t an option — but at Weishaar & Weber Dentistry, it is. Dr. Anthony Weber, Dr. Sue Weishaar, and Dr. Lori Weber provide patients with veneers, improving the look of your teeth and providing a new level of protection. If you live in or near Spokane Valley, Washington, and are ready for the smile of your dreams, call the office to schedule your initial consultation. You can even book online. "I was referred to this office by a family friend and couldn't be happier!!!" "The office and staff are fantastic!" "Was dreading my appt today! I'm not a fan of the dentist! I love this place so much." "First time going to this dentist and I loved it." "I've referred all my friends, family and co-workers to them, I love this office so much." "Dr Sue is amazing and does a ver complete exam of my teeth and mouth each time I visit." "Her time and patience really solved my problem when I couldn't get anywhere." "My experience with Dr Sue was wonderful." "She is always polite and friendly, without going overboard"." "I have always received fantastic care here, the Doctors and team are exceptional!" "The office is warm and inviting and the staff is very welcoming and made me feel at ease"
For those considering a complete smile design, sometimes called a smile makeover, veneers can play an integral role in helping you reach your goals. When you see your dentist at Weishaar & Weber Dentistry, you typically need three appointments to get veneers, along with a follow-up. During your initial consultation, you can discuss your smile goals with your dentist, detailing what you’d like your teeth to look like. Your dentist performs a thorough examination to determine if veneers are right for you. In some cases, they may request X-rays or take impressions of your teeth and mouth. At your second appointment, your dentist prepares your teeth for the veneers. They remove about a half-millimeter of your tooth’s enamel and make a model, which they send to a laboratory that designs the veneer. Your dentist may place a temporary veneer. Once the lab makes your veneers, which typically takes 2-4 weeks, you’ll have your final bonding appointment. Your dentist checks the veneer for fit and color and makes any necessary adjustments. Once they achieve the proper fit, they clean, polish, and etch your tooth, which strengthens its bond to the veneer. Your dentist applies cement to the veneer, then places it on your tooth. When it’s in position, a special light activates the cement, causing it to cure. Once set, your dentist removes any excess cement, checks your bite, and ensures you’re comfortable with your new smile. If so, they schedule a follow-up appointment to check for fit and make necessary adjustments. If your smile has been hiding behind closed lips, it’s time to let it shine brightly. 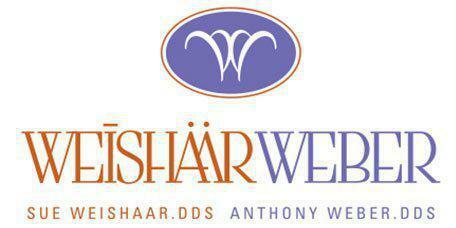 Contact the professional team at Weishaar & Weber Dentistry to schedule your appointment. Call the office or book online today. "I would like to give my highest regards to this dental office for far exceeding my expectations." "I am so Happy to have picked Dr. Weber for my needs, the whole experience of getting dentures has been painless." "I felt very welcomed and I feel they honestly cared and Dr Weber did an awesome job on the repair! Highly Recommend!" "A special thanks to all that staff who consistently go above and beyond to provide an incredible experience for their clients - like me!" "Great service from an exceptional group of professionals who take the extra steps to ensure the wellbeing of their patients." "I cannot say enough good things about this place. They have been *so* amazing, and unbelievably accommodating in so many ways."